Over the last few months we have reviewed a number of interesting web tools and mobile apps teachers can use to collect students feedback. And as we have argued elsewhere, access to students feedback can positively impact both the teaching and learning process. On the one hand, it provides teachers with a discerning window through which they can assess their teaching methodologies, assess students comprehension, and based on gleaned insights, formulate working plans to meet students learning needs. On the other hand, the act of providing feedback empowers students with a voice, makes them feel valued and that their opinion matters and therefore engages them on a deeper level in the learning process. In today’s post, we are particularly focusing on two basic feedback gathering strategies: polls and surveys. We have curated for you some of the most popular web tools you can use to create various types of polls and surveys. 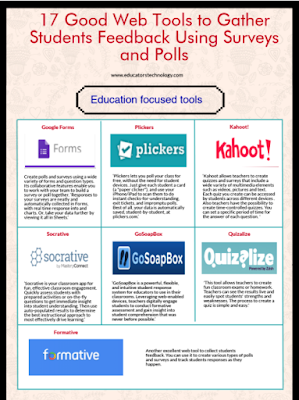 In doing so, we have divided our collection into two main categories: education-focused tools which are basically tools that are primarily created for use within educational settings (yes, we included Google Forms in this category) and general survey and poll creation tools. Check them out and share with us your feedback in our Facebook page. There is an infographic version of this post which you can access and download from this page. Another excellent web tool to collect students feedback. You can use it to create various types of polls and surveys and track students responses as they happen. A good web tool to engage your audience in real time interaction. It lets you design interactive polls and surveys and deliver them live to your audience. ‘Responses appear in an animated graph or chart embedded in your presentation. Results update live for all to see.’ Poll Everywhere works in major presentation tools such as Powerpoint, Keynote, and Google Slides. A simple tool to easily create polls to embed on your blog or website. Micropoll provides you with the tools to customize your polls, add various types of questions, and analyze audience responses. Use Zoho Survey to create multilingual surveys that others can access from any device. You can use pre-designed templates or start your survey from scratch. Results are graphically displayed in real time. Lets you create and deliver online polls quickly and easily. Just compose your questions, email or post the link to your poll online, and get results. It allows you to create your own surveys, questionnaires, and quizzes. It offers a real time reporting dashboard that enables you to see results and statistics of your survey. You can share your surveys through a generated URL, embed them on your website or share them through email. ‘SurveyPlanet offers a tremendous set of free tools for designing your survey, sharing your survey online, and reviewing your survey's results’. Some of its features include: custom survey themes with responsive layouts, images upload, multiple languages, pre-written questions, various question types, question branching and many more. The 20 Best Online Survey Builder Tools (Zapier). 15 Good Tools for Quickly Gathering Feedback from Students (Free Technology for Teachers). 12 Great Formative Assessment Tools for Teachers (Educational Technology and Mobile Learning). Teaching Tools: Surveys/Polling/Quizzes (Harvard Library). 13 Great free survey tools for teachers (Educational Technology and Mobile Learning). 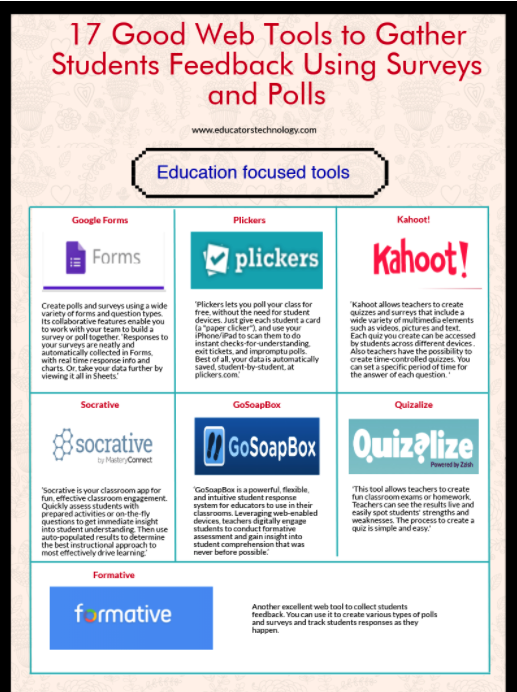 Polling The Classroom: 4 Free Polling Tools to Keep Students Engaged (Open Education Database).